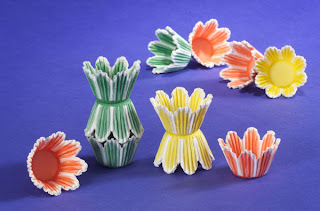 Awhile back on Design Mom she posted about these tulip baking cups and I loved them so much I bookmarked the page and then forgot about them. With springtime in the air recently, these popped back into my mind and I made a mental note to purchase some for little gifties for my friends. I think I'll wrap them in a clear cellophane bag and some pretty grosgrain ribbon. These tulip cups would look beautiful wrapped around a Barefoot Contessa coconut cupcake.